Some active managers make more active decisions than others. There have been numerous studies finding that the average active manager fails to outperform the broad equity market on a consistent basis. However, not all managers may be making the same level of active decisions versus a broad equity benchmark. An active manager that does not exhibit quantifiable differences in holdings versus a benchmark is unlikely to meaningfully differentiate itself in performance, which makes it less likely to outperform net of fees. As such, it is worth considering how to quantify a manager’s active decisions, and if there are certain groups of active managers which exhibit superior investment results. Overall portfolio coordination is critical for actively managed multi-asset class portfolios. As risk-based and target date funds generally provide exposure to a variety of asset classes, often by way of a fund-of-funds structure, it can be more challenging to evaluate whether the advisor (who may be coordinating multiple portfolios/funds) is making active decisions which are meaningfully different than the broad market. However, there are several steps discussed in this paper that investors can take to determine whether the overall structure of the portfolio is coordinated and the manager’s active decisions can be effective. Relative Performance should be viewed within its environmental context. Contrary to some of the conclusions on both sides of the debate, neither active nor passive represents the most favorable approach in all environments, and each will go through periods of outperformance versus the other. Also, while relative performance has generally been used to evaluate the merits of active management, there may be other factors to consider when choosing between an active or passive strategy, including the manager’s ability to fulfill a specific role in an investor’s total portfolio, or manage a specific risk, which cannot be met through exposure to the broad market. We acknowledge that investors have different preferences when it comes to actively versus passively managed strategies. However, we believe that the items above should be evaluated by all investors regardless of their investment philosophy. In order to address these topics, the first section of this paper discusses methods for identifying managers who are truly active, evaluates relative performance of active and passive managers historically, and provides an overview of several variables that can affect manager performance. The second section discusses methods for evaluating the level of active management in target date funds. The third section discusses how the impact of fees may be different for truly active managers compared to managers charging active fees in exchange for benchmark-like portfolios. On a basic level, determining whether an investment strategy is active or passive is as simple as reading the fund’s prospectus or looking at the fund’s classification in a fund database such as Morningstar in order to see if it tracks a market index. If this definition of active is used, a group of managers could be constructed and compared against a broad market index to evaluate the merits of active management. To evaluate these managers, a universe of core-oriented U.S. large cap equity mutual funds in the Morningstar Direct database1, excluding index funds, was constructed2. The performance of the universe was then compared to the S&P 500 Total Return Index3 (S&P 500), a widely accepted U.S. large cap equity benchmark. Specifically, the analysis evaluated the relative performance of the median large cap core fund versus the S&P 500 as well as the percent of funds that outperform the benchmark over each rolling five-year period. As the charts below illustrate, while certain time periods have been more or less favorable for active managers, overall there does not appear to be strong evidence that non-index fund managers consistently outperform. For example, over any given five-year period, on average, only 46% of the non-index funds outperformed the S&P 500, on a net-of fees-basis, and the median non-index fund underperformed the benchmark by approximately -0.37% net of-fees (annualized) on average. The previously stated working definition of active management allows for managers with the flexibility to invest in securities which are not found in the benchmark. However, the resulting universe likely contains managers with portfolios that do not exhibit meaningful quantifiable differences in holdings versus the benchmark, despite charging an active management fee. A calculation called Active Share can be used to differentiate between these managers. Active Share was developed by professors at the Yale School of Management and is presented in a study originally published in 2006, updated most recently in 20134. In general, Active Share measures the difference between an investment manager’s portfolio and benchmark on a holdings basis. Differences may arise from managers not holding securities included in the benchmark, holding securities other than those included in the benchmark, or holding securities in different weights than are found in the benchmark. A portfolio’s Active Share will range between 0% and 100%, 0% signifying that the portfolio is identical to the benchmark, and 100% signifying that the portfolio and benchmark have no common holdings. The Active Share calculation provides a more systematic way of evaluating the extent to which a manager is differentiating itself from a benchmark, and can help to identify closet indexers (active managers with benchmark-like portfolios). High Active Share group: Since the Yale study classified active managers as those with an Active Share of greater than 60%, the first group represents mutual funds with an Active Share of greater than 60%, consistent with the original study. Low Active Share group: The second group represents funds with an Active Share of less than 60% (i.e., those likely to operate with more index-like portfolios). Top-quartile Active Share group: it can be argued that even managers with an Active Share of 60% have substantial portfolio overlap with their respective benchmarks and only managers with Active Shares above 80% or even 90% are likely to have truly distinct portfolios. Thus, the third group represents funds whose Active Share fell in the top quartile of the universe (i.e., approximately 88% and above) and can thus be considered truly active. As the following chart illustrates, funds with an Active Share of less than 60% tend to perform more similarly to the benchmark compared to managers with higher active share. However, these managers tend to lag overall, as on average over any given five year period the median fund in the low Active Share group experienced returns of 8.83% net-of-fees (annualized), versus 9.22% for the S&P 500. In contrast, funds with higher Active Share have tended to experience comparatively superior results, as the median fund in the top quartile Active Share group experienced returns of 10.11% net-of-fees (annualized) on average over the 89 rolling 5-year periods from 01/01/1987 to 12/31/2013 (0.88% above the S&P 500). These results suggest that while the performance of the average non-index manager may not be impressive, focusing on managers that are truly active (i.e., those with high Active Share) may provide more favorable results5. 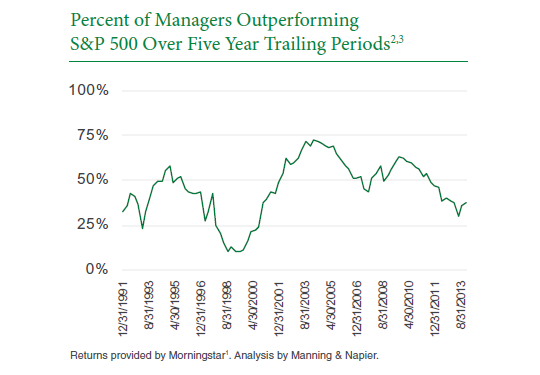 The previous chart also illustrates that there are periods of time where the performance of truly active managers (those with high active share) may deviate meaningfully from the performance of the benchmark over an extended period of time. As discussed in more detail in the next section, the performance of the median top quartile Active Share manager lagged the benchmark in the late 1990s, but was significantly higher than the benchmark in the early to mid 2000s. 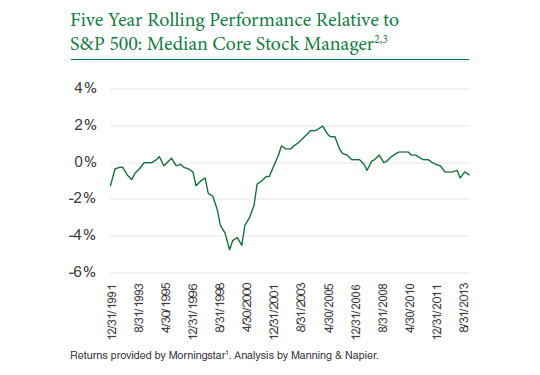 Thus while truly active managers have had higher 5-year returns on average relative to the benchmark, the timing of outperformance and underperformance appears to depend substantially on the market environment. Realistically, both active and passive strategies go through periods of favorable and unfavorable environments. While a variety of factors can affect whether the environment is more favorable for one strategy over the other, active managers have tended to have more success managing against downside risk relative to the benchmark in periods when broad market returns are negative. However, active managers have tended to lag in periods when broad market returns are very strong, particularly when narrow segments of the market begin to drive returns and represent a significant portion of the benchmark. For example, despite providing strong absolute returns, the top quartile Active Share managers lagged the S&P 500 in the late 1990s during the technology sector-driven bull market as the weighting to technology stocks increased for the S&P 500 to a much greater extent than for the average top quartile Active Share manager. However, the average top quartile Active Share manager provided performance significantly higher than the S&P 500 in the subsequent valuation-driven correction from 04/01/2000 through 09/30/2002. More generally, environments with differentiated behavior between stocks offer the best opportunities for active managers. The period from 10/01/2002 through 10/31/2007, which was a recovery period for the U.S. stock market, was such an environment, and active managers generally performed well over this time period on a relative basis. In periods where macroeconomic factors drive stocks together, it is typically more challenging for active managers to differentiate themselves from the benchmark. The current bull market, which began on 03/01/2009, contained several of these periods and, as a result, the environment has often been challenging for active managers. Also, while the median active manager generally outperformed in the credit crisis, the magnitude of outperformance was generally less than during the previous technology bubble drawdown given higher correlations between stock prices. In light of environmental factors that are likely to have a meaningful impact on relative performance of managers, when evaluating any manager, it is important to consider performance over a variety of environments. Doing so helps to remove some of the biases that exist over shorter time periods, which may be encompassed primarily by bear or bull market time periods or may have specific macroeconomic factors playing a strong role in performance. Relative performance for the current U.S. stock market cycle, which spans from 04/01/2000 through current, is displayed on page 5, along with periods of positive and negative returns over the past several decades. Active Share for the equity portion of the total portfolio. Looking at a target date family’s longest dated fund, such as a 2055 fund, can help to focus the attention on equities, as these funds tend to have allocations to fixed income below 10%. The median 2055 fund has a ratio of 66% to 34% between U.S. equities and non-U.S. equities. With this in mind, computing Active Share versus a comparable blended benchmark, such as one made up of 66% Russell 3000® Index6 and 34% MSCI ACWI Ex USA Index7, is a good starting point for understanding how active the target date manager is on an equity level. The coordination of the overall portfolio. There are multiple decisions for an investment manager to make when constructing a target date portfolio, including how the overall asset allocation mix changes over time, allocations to various underlying portfolios, and the individual securities held in these portfolios. If the strategy is active, there should be a coordinated mechanism to ensure that there is not significant overlap between underlying portfolios, which may diminish the effect of the active asset allocation and security selection decisions management is making at the underlying fund level. A low Active Share for the equity portion of the portfolio may suggest that there is a lack of coordination among underlying funds, even if the funds are relatively active on an individual level. Another way to evaluate the potential efficacy of a manager’s overall coordination would be to determine whether the managers for the underlying portfolios are also involved to any extent in the overall construction of the target date portfolio. Overall portfolio transparency. Given the layered nature of many target date strategies, there may be limited information reported regarding the overall composition of the portfolio, and in many cases, only the number of underlying funds are disclosed, rather than aggregate number of holdings. In these cases, it may be more difficult to ascertain whether there may be coordination or over-diversification concerns with the strategy. However, more generally, lack of transparency may be a concern in and of itself, and to the extent there is difficulty getting information about the methods of structuring the total portfolio and the resulting composition, it can be more challenging to evaluate whether the active management fees charged are resulting in a truly active target date fund. While this paper focuses on stock selection, evaluating the degree of active decisions being made for the fixed income portion of the portfolio is no less important. However, Active Share may be a less relevant calculation for fixed income securities. For example, a portfolio and its benchmark may hold U.S. Treasury bonds with the same maturity date, but issued within a few days of each other. In this case, both bonds will behave similarly with respect to yield and interest rate sensitivity; however, Active Share would count each as different holdings. Instead, a portfolio’s overall characteristics specific to fixed income, including measures of interest rate sensitivity, sector allocation, and credit quality, are among factors that should give evidence of active decisions versus a broad fixed income benchmark. Overall, while there may be a few additional steps to take when evaluating the active choices being made for a target date strategy, we believe ultimately the same basic principle that is important for a single asset class is true for a target date strategy as well: investors should avoid paying active management fees in exchange for portfolios that do not make active decisions which are meaningfully different than the broad market. Fee Implications for Passive Strategies: As it is impossible to invest directly in an index, investors preferring a passively managed portfolio pay a fee for a manager to track a specific benchmark. While fees for passively managed portfolios tend to be lower than those that are actively managed, investors should understand that these fees do impact the portfolio’s performance. Given that the goal of a passive portfolio is to match the returns of an index, performance should be expected to lag that index by a margin roughly in line with the expenses of the passive fund. Fee Implications for Active Strategies: The goal of an actively managed strategy is to invest in the most attractive securities. As this may result in a portfolio that is significantly different in composition from the benchmark, an investor may potentially benefit in a variety of ways. For any benefits of the active approach to be practical, they must outweigh active management fees, which are typically higher than for passive strategies. Some may argue that active management fees are difficult to overcome and that the best approach is to choose the lowest cost option, such as a passive strategy. 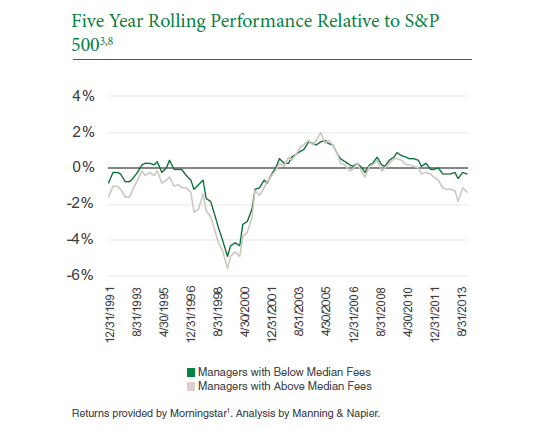 There is evidence to suggest that, without any added consideration as to a manager’s level of active management, higher fees are generally associated with less favorable relative performance versus a benchmark. For U.S. large cap core non-index mutual funds7, the chart below shows median performance for a group of managers with below median fees and a group of managers with above median fees. Since there is typically a difference in expenses for share classes that are distributed to institutions and retirement plans, median breakpoint fees were computed for these shares separately from retail shares. The chart above may lead one to conclude that a lower cost option is almost always better. However, in practice, the level of fee charged for active management is not always consistent with the actual level of active management that is applied to the portfolio. Clearly, the worst case scenario would be to pay high active management fees in exchange for a portfolio which is similar to a benchmark, as high fees combined with low Active Share are an almost guaranteed way to underperform on a relative basis. The alternative—paying a reasonable fee for active management in exchange for a portfolio which is truly active—is worth evaluating versus the benchmark and other groups of active funds. The chart above compares several groups within the U.S. large cap core non-index fund universe7, each with different fee level and Active Share characteristics. As expected, the group with above median fees and below median Active Share exhibits poor relative performance in most environments, as low Active Share typically offers few prospects for overcoming the higher active management fees. Those with lower Active Share and below median fees tend to fare better but do not offer consistent outperformance versus the benchmark. Comparatively, both higher Active Share groups appear to have experienced results which are superior to the two lower Active Share groups. Also, while a similar pattern holds for the higher Active Share groups (managers with lower fees will, on median, outperform those with higher fees), it is important to note that even the active managers with higher fees have experienced periods of success relative to the benchmark. 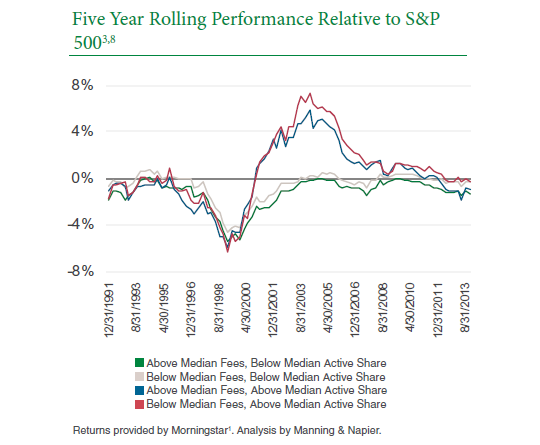 Specifically, the high Active Share groups with above median fees and below median fees averaged an excess return of 0.20% and 0.72%, respectively, over five-year rolling periods vs. the S&P 500. Overall, this data suggests that the overall level of fees charged by active managers has more direct performance implications for lower Active Share managers versus managers that are truly making active decisions. The active versus passive debate is likely to be ongoing. Yet, in order for investors to reach a conclusion and choose an investment manager, there are several factors to consider. It is crucial to understand whether a manager is truly making active decisions, and if not, to avoid paying high fees for benchmark-like portfolios. While data suggests that truly active managers have had success on a relative basis over the long term, there are likely to be periods that are more favorable for one strategy over another, and as a result, it is important to consider performance over a variety of market environments. For total portfolio solutions, such as target date funds, it is important for investors to be aware of the overall coordination of the fund in order to ensure that the benefits of active management are not lost as a result of over-diversification. Lastly, while investors should be conscious of the expenses they are paying for investment management, data has shown that paying a reasonable active management fee for a truly active approach has generally resulted in favorable relative performance over the long term. Manning & Napier’s target date offerings include mutual funds (Manning & Napier Fund, Inc. Target Series) and affiliate collective investment trust (CIT) funds (Manning & Napier Retirement Target CIT Funds and MANNING & NAPIER GOAL® CIT Funds). Because target date funds invest in both stocks and bonds, the value of your investment will fluctuate in response to stock market movements and changes in interest rates. Investing in target date funds will also involve a number of other risks, including issuer-specific risk, foreign investment risk, and small-cap/mid-cap risk as the underlying investments change over time. Additionally, some target date funds invest in other funds and therefore, may have additional risks associated with the underlying funds. Principal value is not guaranteed at any time, including at the target date (the approximate year when an investor plans to stop contributions and start periodic withdrawals). Past performance does not guarantee future results. For more information about any of the Manning & Napier Fund, Inc. Series, you may obtain a prospectus at www.manningnapier.com or by calling (800) 466-3863. Before investing, carefully consider the objectives, risks, charges and expenses of the investment and read the prospectus carefully as it contains this and other information about the investment company. 1© Morningstar 2014. All rights reserved. The information contained herein: (1) is proprietary to Morningstar and/or its content providers; (2) may not be copied, adapted or distributed; and (3) is not warranted to be accurate, complete or timely. Neither Morningstar nor its content providers are responsible for any damages or losses arising from any use of this information, except where such damages or losses cannot be limited or excluded by law in your jurisdiction. Past financial performance is no guarantee of future results. 2Universe includes all U.S. domiciled open end mutual funds with a Morningstar Institutional Category of All-Cap Core, Giant Core, Large Core, Large Valuation-Sensitive Growth, or Large Relative Value. The oldest available share class of each fund was used. 3The S&P 500 Total Return Index is an unmanaged, capitalization-weighted measure of 500 widely held common stocks listed on the New York Stock Exchange, American Stock Exchange, and the Over-the-Counter market. The Index returns assume daily reinvestment of dividends and do not reflect any fees or expenses. Index returns provided by Morningstar. S&P Dow Jones Indices LLC, a subsidiary of the McGraw Hill Financial, Inc., is the publisher of various index based data products and services and has licensed certain of its products and services for use by Manning & Napier. All such content Copyright © 2014 by S&P Dow Jones Indices LLC and/or its affiliates. All rights reserved. Neither S&P Dow Jones Indices LLC, Dow Jones Trademark Holdings LLC, their affiliates nor their third party licensors make any representation or warranty, express or implied, as to the ability of any index to accurately represent the asset class or market sector that it purports to represent and none of these parties shall have any liability for any errors, omissions, or interruptions of any index or the data included therein. 4Active Share and Mutual Fund Performance. Antti Petajisto. January 15, 2013. 5Depending on the investment strategy utilized by active managers, there is the potential for increased trading activity compared to passively managed funds, which may lead to higher realized capital gains in a given year. 6The Russell 3000® Index is an unmanaged index that consists of 3,000 of the largest U.S. companies based on total market capitalization. The Index returns are based on a market capitalization-weighted average of relative price changes of the component stocks plus dividends whose reinvestments are compounded daily. The Index returns do not reflect any fees or expenses. Index returns provided by Morningstar. 7The MSCI ACWI ex USA Index is a free float-adjusted market capitalization index that is designed to measure equity market performance in the global developed and emerging markets and consists of 43 developed and emerging market country indices outside the U.S. The Index returns do not reflect any fees or expenses. The Index is denominated in U.S. dollars. The Index returns are net of withholding taxes. They assume daily reinvestment of net dividends thus accounting for any applicable dividend taxation. 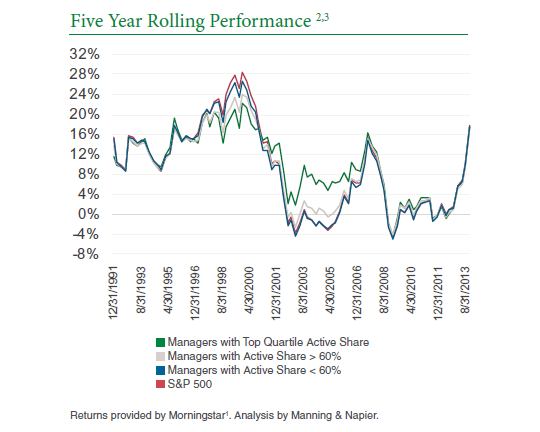 Index returns provided by Morningstar. 8Universe includes all U.S. domiciled open end mutual funds with a Morningstar Institutional Category of All-Cap Core, Giant Core, Large Core, Large Valuation-Sensitive Growth, or Large Relative Value. All share classes were sampled. Median fees were assessed separately for share classes distributed as (1) institutional and retirement plan share classes and (2) retail share classes.